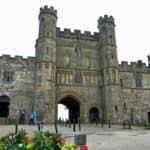 Rathfinny Wine Estate and Sussex Sparkling. If you’ve not heard of them yet you soon will because Sussex is the future of English wine production. 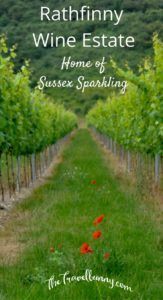 With award-winning wines spilling out of the county it won’t be long before you’ll be toasting your celebrations with a glass or two of Sussex Sparkling. 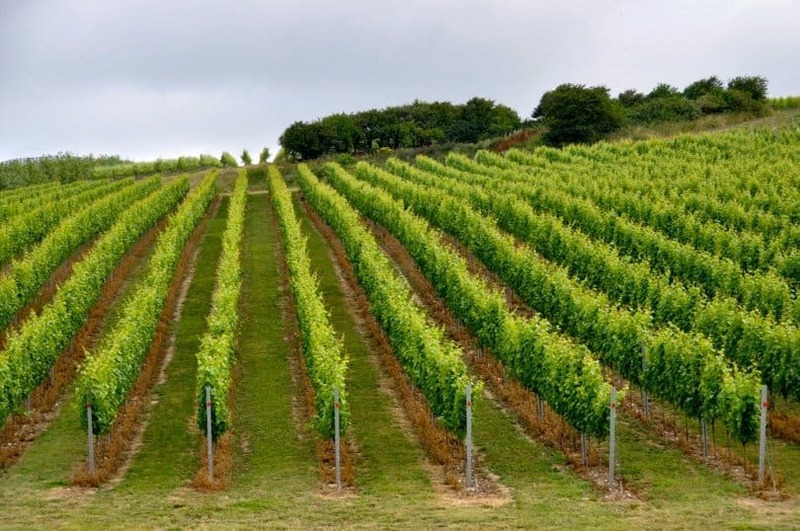 Rathfinny, near Alfriston in East Sussex, is the state-of-the-art vineyard that’s on course to become England’s largest single-site vineyard. I dropped by to find out what all the fizz and the fuss is about. I’ve been driving along the same stretch of road, past Alfriston, for years and had no idea that beyond the treeline something special was going on. 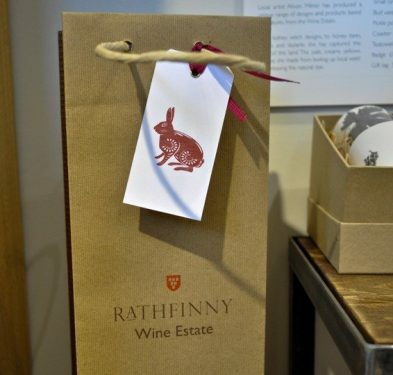 Rathfinny Wine Estate was being carefully planned, planted and nurtured. Owned by Mark and Sarah Driver, it sits cosseted from the south-westerlies of the English Channel by National Trust lands. 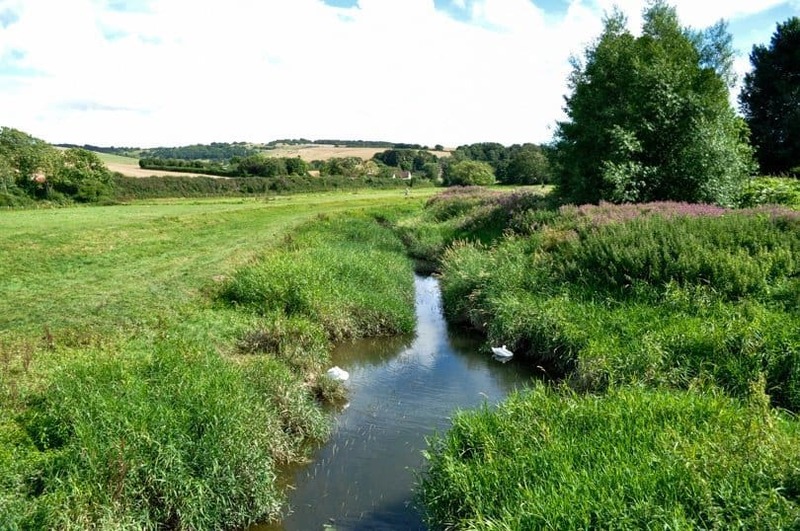 To the North it’s bordered by pale cornfields and nestles within a south-facing bowl. 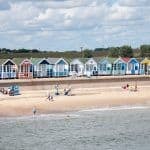 To the South it’s just three miles from the sea and the chalk soils and micro-climate make it the perfect location for wine-making. 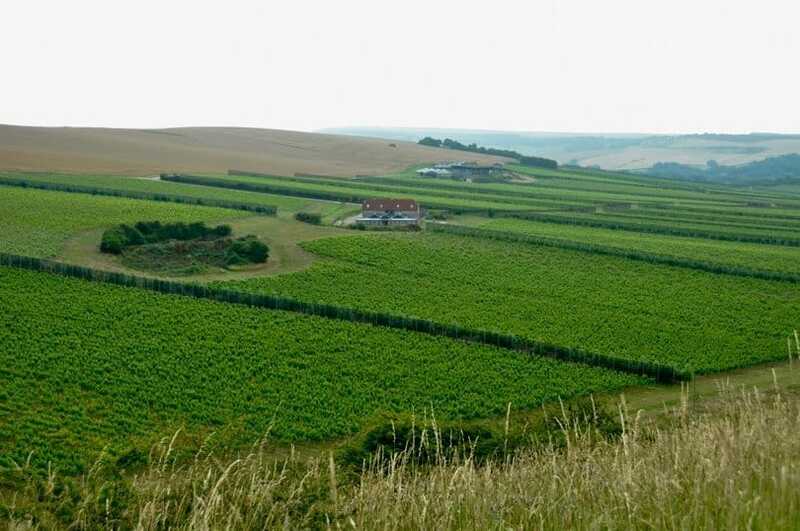 Sussex has the same climate that the Champagne capital Épernay had 30 years ago and this is just one of dozens of vineyards that have rooted in Sussex. We appear to be growing our very own wine region here in the South. 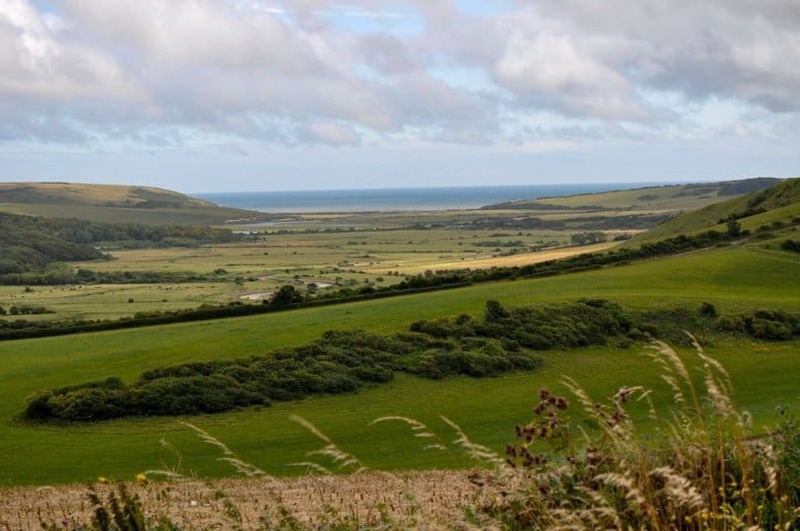 This July, instead of driving straight past, we took the road to Rathfinny Wine Estate. 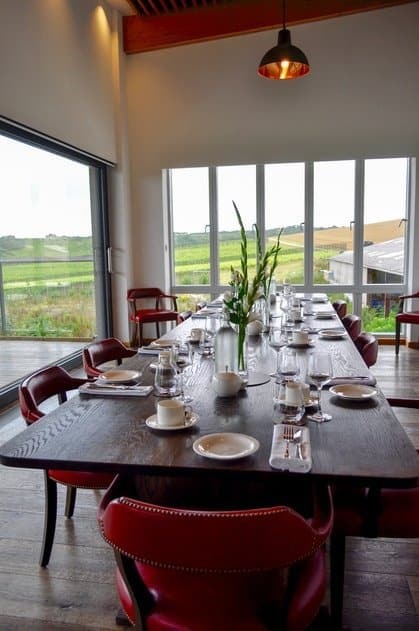 A tour of the vineyard and winery was on the agenda followed by a ‘Winemakers Lunch’ and a night in the ‘home away from home’ Flint Barns. I was captivated by the view as we drove through the highest point of the estate towards the winery. Blue sea sparkled in the distance the South Downs graduated from natural thickets, wild flowers and grassland into a bowl of lush, green regimented vines marching into the distance. 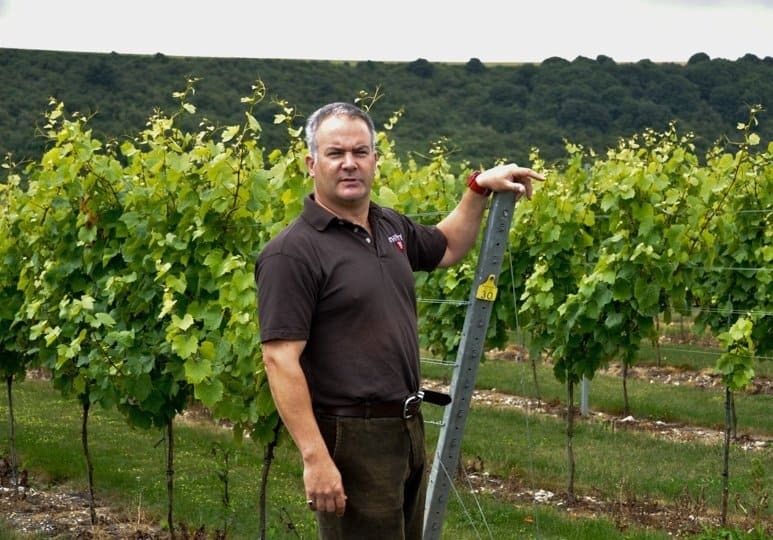 Richard James, the estate’s Operations and Environment Officer took us straight into the vines explaining why different vines are planted in certain areas. 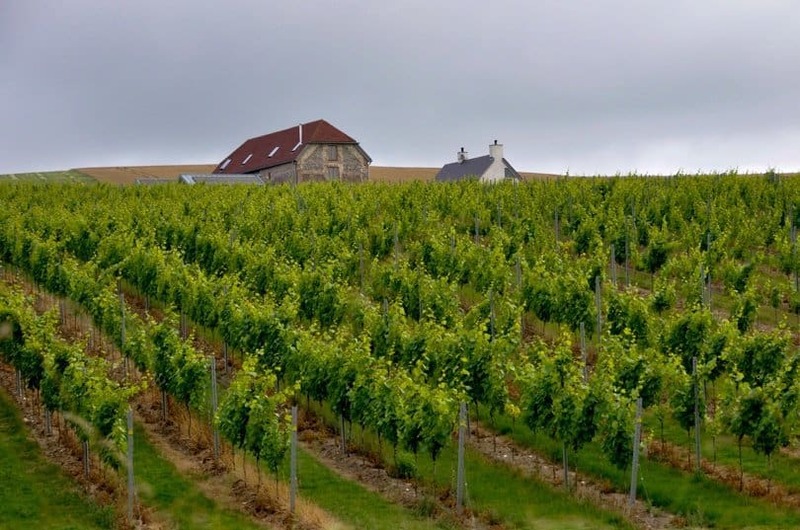 Rathfinny has three main types of vine; Chardonnay, Pinot Noir and Pinot Meunier. Small quantities of Pinot Blanc and Pinot Gris are also grown. Rathfinny’s vines, which are mainly from French rootstock, are high grafted to prevent frost damage. Frost only occurs at the bottom of the bowl and we could feel the difference in temperature as we walked downhill. Pinot Noir is planted near the bottom as it prefers a damper soil. Vines are planted in dead straight rows by German GPS enabled machinery. With a difference of less than 14mm from the top of the row to the bottom, the straightness of the rows really are a thing of beauty. 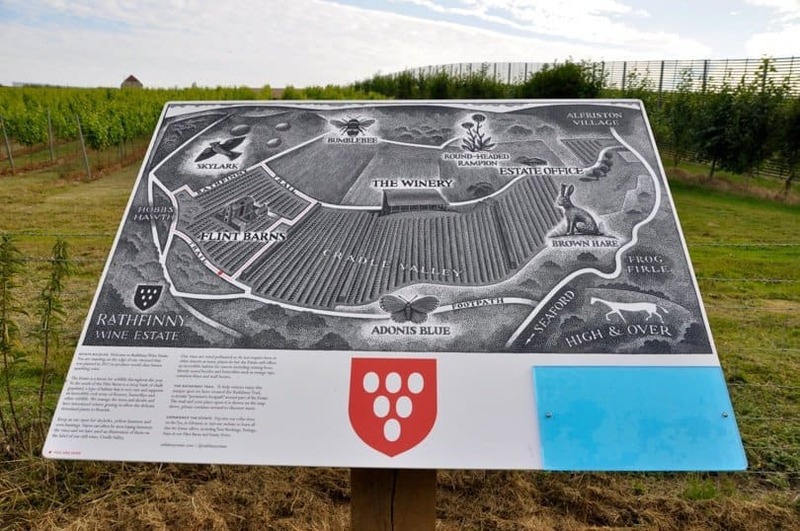 Each vine is even attributed its own grid reference. The state-of-the-art winery is our next stop and was designed by a local architect using locally sourced materials. A wild-flower planted roof follows the rolling lines of the South Downs. The building is designed to be sustainable using recycled water, where possible, and solar panels for energy. We take of tour of the presses and gleaming fermentation equipment. 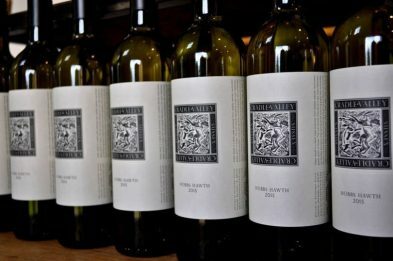 It’s clear that the Rathfinny vision is about more than producing exceptional wines. 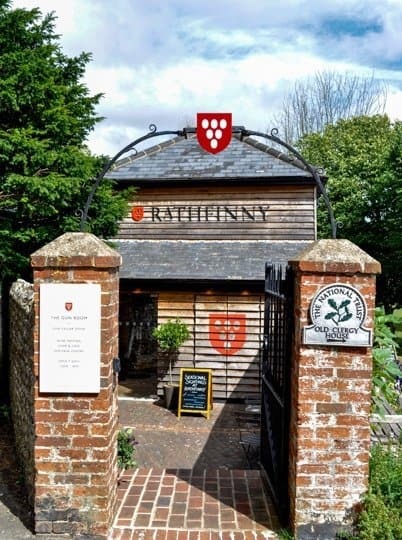 The vineyard has become intertwined with the local community providing jobs and sponsoring the new Rathfinny Research Winery which is part of the Plumpton College Wine Research Centre. The first Sussex Sparkling is currently bottled and maturing in the winery. It’ll be ready for popping in 2018. Rathfinny will produce three different sparkling wines. A non-vintage blend, a vintage blend in exceptional years and a rose. One million bottles a year are planned; 50% for the UK market and 50% for export. 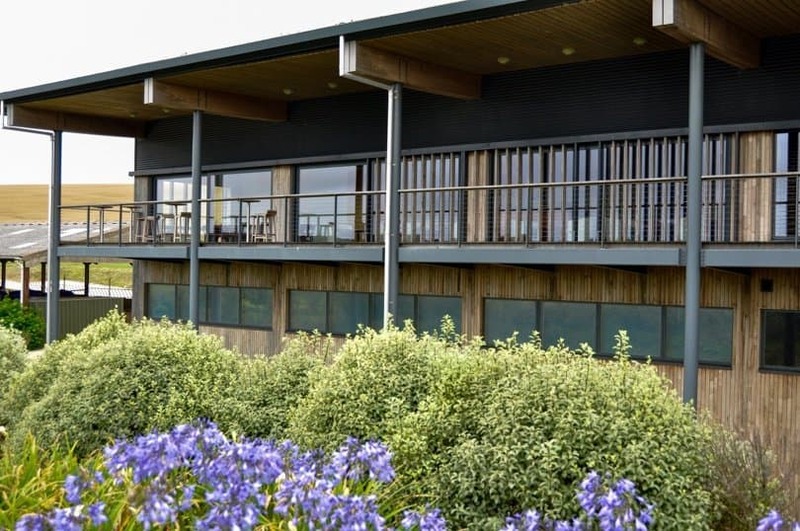 After the tour the Tasting Room is the setting for lunch with panoramic views over the vineyard. 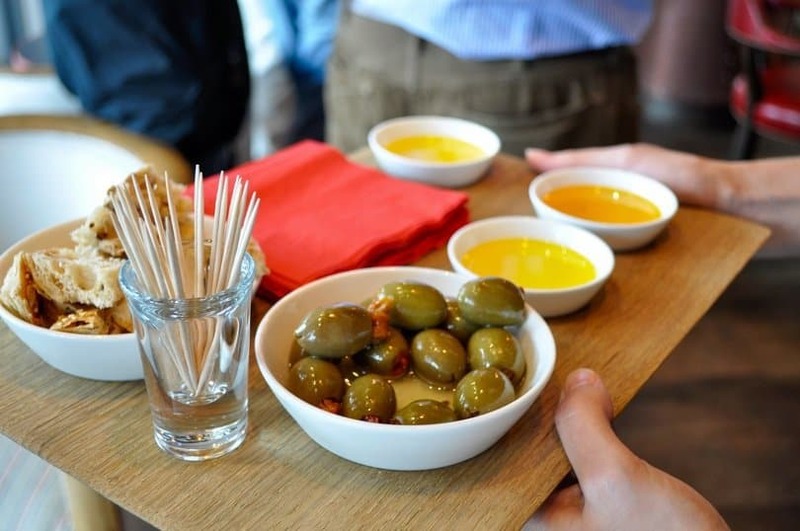 We start with an aperitif of Plumpton sparkling rose and canapes of olives, breads and local oils. Lunch is a delicious range of locally sourced produce. 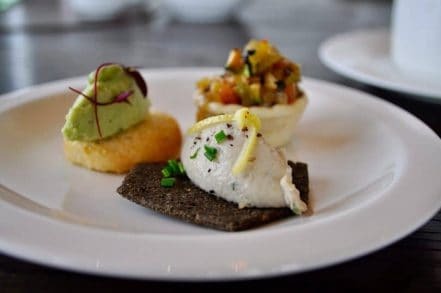 Starters are a sharing platter of vegetable salsa in pastry cases, Mackerel pate on charcoal biscuits and broad bean and mint crostini. 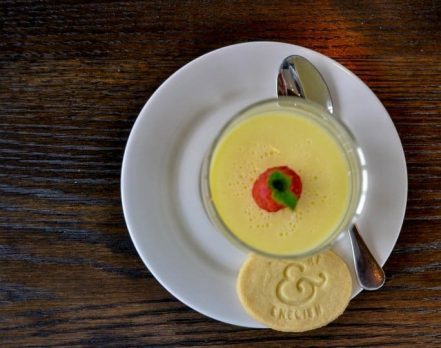 Individual quiches made with Sussex Charmer cheese and roasted vegetables with green salad are followed by a piquant lemon posset with shortbread. The food is delicious as is the light, crisp 2014 Cradle Valley white made with a blend of Pinot Blanc and Chardonnay that accompanies. After lunch we hop in the car a drive a few hundred yards to the imposing Flint Barns. The brick and flint structure was built on the site of the original farmhouse to house the pickers and pruners during the autumn and winter. Don’t let that put you off, I imagine this is much more upmarket than your average picker’s accommodation. The lobby opens into a light-flooded dining room with separate lounge area. 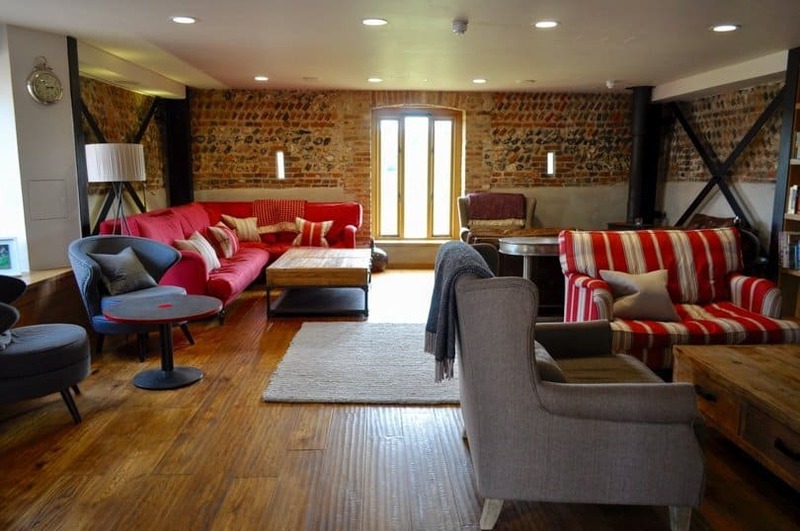 Exposed beams, brickwork and reclaimed oak flooring give a rustic but contemporary feel. 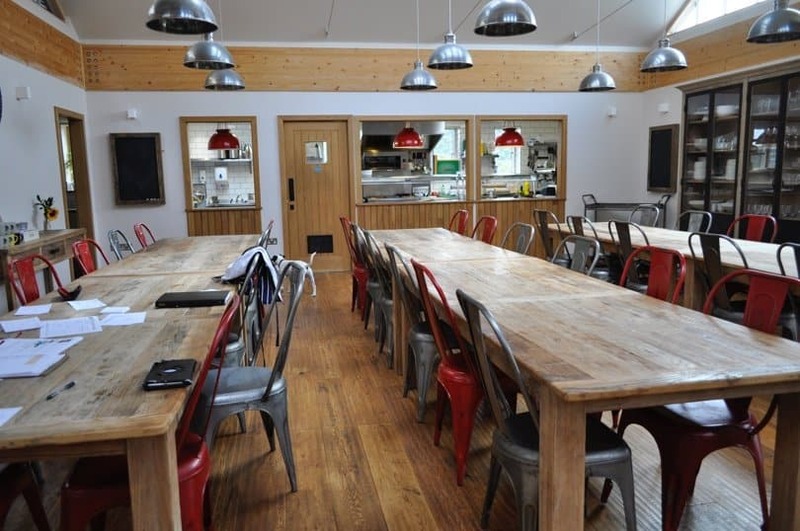 There are long refectory tables, an open kitchen and views across the vineyard. 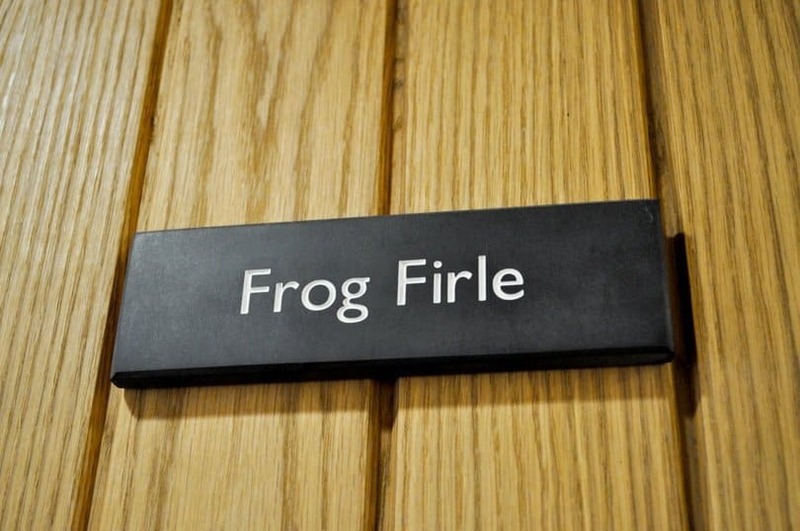 Bedrooms are named after nearby beauty spots – we’re in ‘Frog Firle’. ‘Francebottom’ and ‘Pinchmedown’ are also in our corridor. 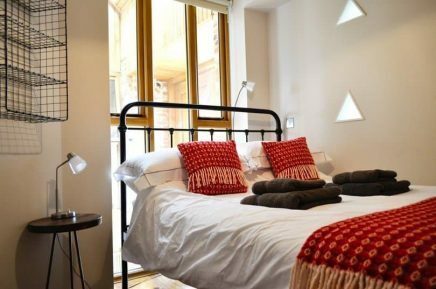 I’m sure there’s a joke there somewhere… The rooms are small and basic but cosy and comfortable with wooden floors, bright woollen throws and cushions. 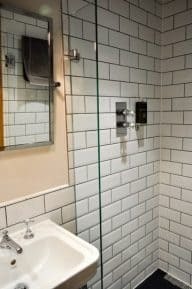 There’s no furniture except the comfy bed with its crisp, white duvet but there’s hanging space, a shelf and a good shower. A large window behind the bed looks down on the huge barn doors to the garden and the rooms opposite so we keep the blind down. 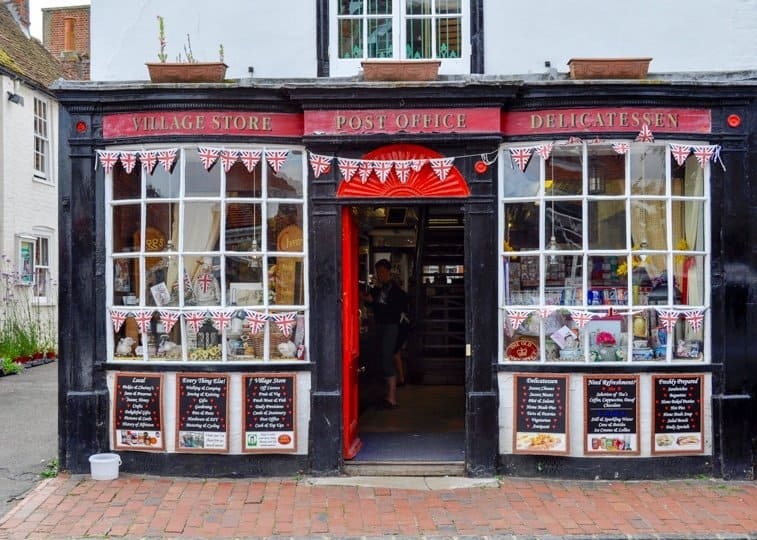 The tiny town of Alfriston is just a five minute drive away so we drop by for a wander. 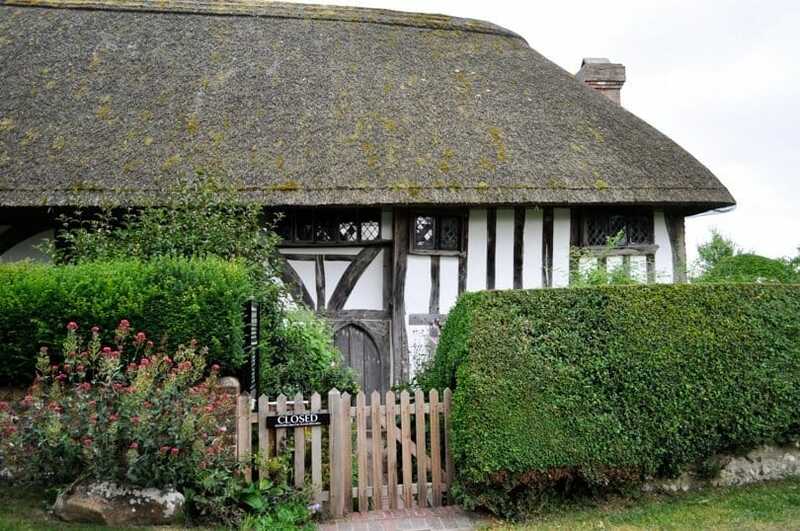 The cottage-lined lanes and cobbled streets are quintessentially English. 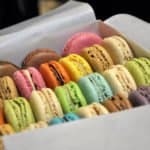 There are independent shops, tea rooms, and the tiniest of market squares. The River Cuckmere passes nearby and it’s easy to park. The church sits on Alfriston Tye next to 14th century Clergy House, the first house ever saved by the National Trust for the princely sum of £10. 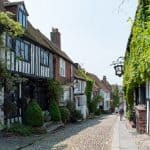 The town, which feels more like a village, is on the South Downs way and is a good stop for hikers. There are three pubs but for now we stop at Stones for ice cream. I plump for honey and ginger by The Sussex Ice Cream Company and it’s divine. 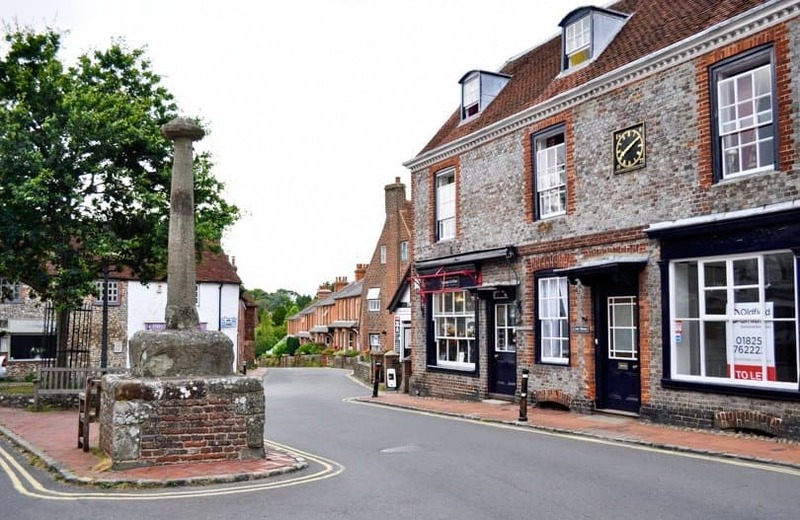 Alfriston is the location for The Gun Room, said to have been the gun store for the Duke of Wellington. 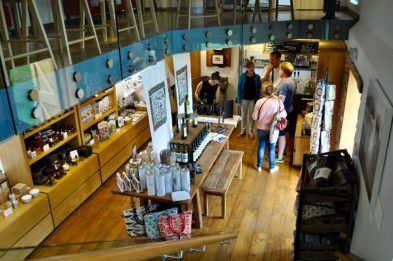 Taste Rathfinny wines before you buy, browse the gift shop or get a coffee at the small café. Prints by Eric Gill, the artist behind the ‘boxing hares’ on the Rathfinny Cradle Valley wine labels, are for sale. Upstairs a small heritage centre has info about the history of the local area dating back to Medieval times. Back at Rathfinny we chill out in The Snug. 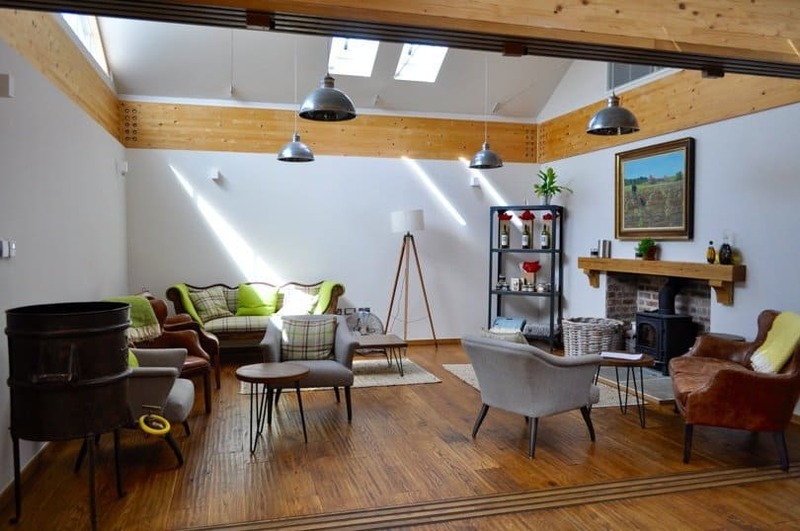 Exposed flint walls, big squashy sofas with woollen throws and a log burner-in the corner make it very homely. Perfect for relaxing in up after walking the Rathfinny trail. A range of books and a big box of board games are there to dip into. A tiny kitchen for guests stocks a range of teas and coffees so we cosy up with a coffee. The Flint Barns don’t serve evening meals for less than ten guests so we head back to Alfriston for dinner. 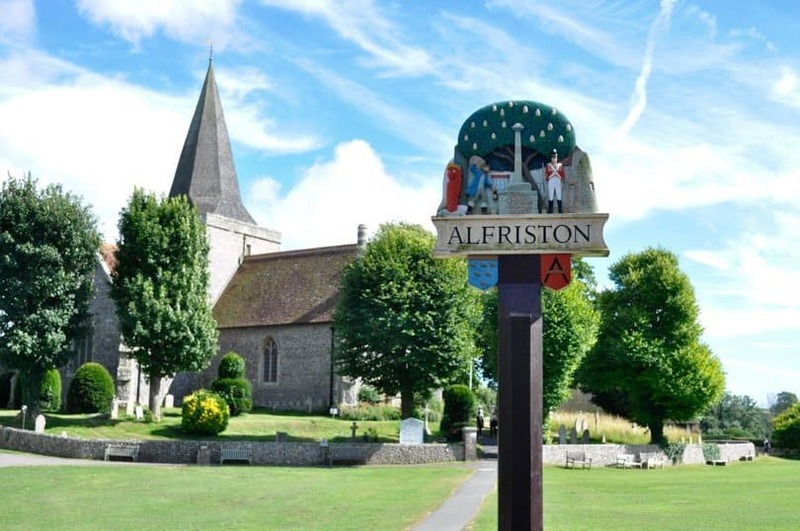 Alfriston is a good half-hour walk from the Barns or a short taxi ride away. There are three pubs which all serve food. We ate at the George, probably the most well-known in the village. We’d left it late, because we were still full from lunch, but food stopped being served at 9pm. We missed it by five minutes but they agreed to sort out a sharing platter. 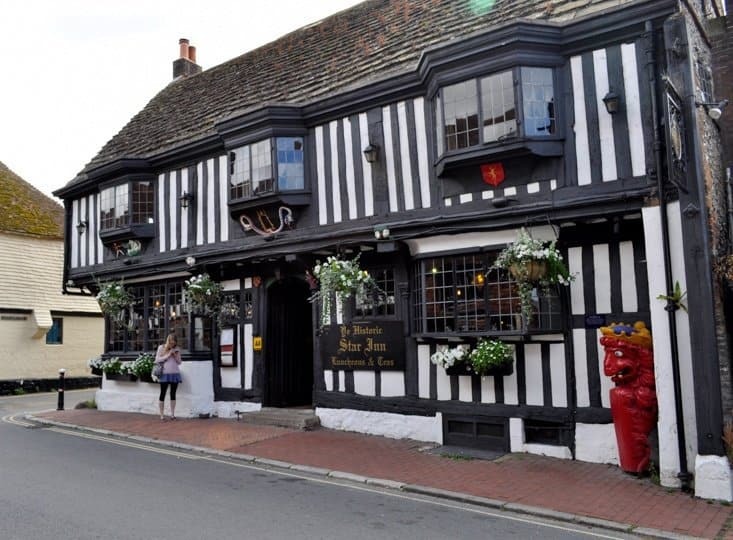 Ye Olde Smuggler’s Inne at the top of the High Street dates back to 1385. 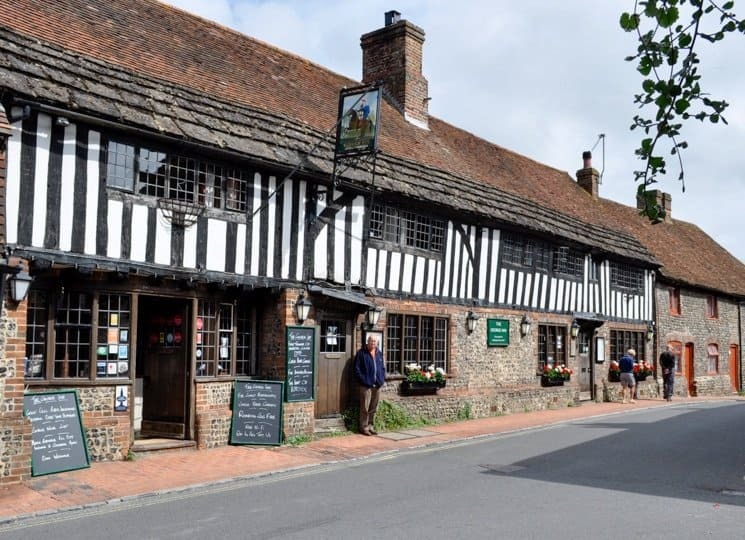 It has a smuggling heritage and is said to have been the headquarters of the notorious Alfriston Gang. The final stop on our mini pub-crawl was the thirteenth century Star Inn with open fires and wooden beams. A pleasant hour was spent at the bar talking ghosts and spooks with the friendly barman who then mysteriously disappeared. Next day, after tearing ourselves away from our incredibly comfy bed, we set out to walk the Rathfinny Trail. The Estate’s trail borders part of the beautiful South Downs National Park and the views are stunning. Wildflowers, butterflies and bees abound but the hares were shy. Back to the Flint Barns we’re served an excellent breakfast. Fruit and cereal is followed by a full English; the perfect way to set us up for the day. It was also a great ending to a very enjoyable 24 hours at the Rathfinny Wine Estate. If you happen to be in Sussex do book one of Rathfinny’s excellent tours, stay at the Flint Barn or even get picking at harvest time. 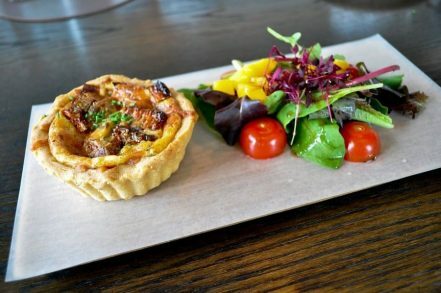 A winery tour + a winemaker’s lunch sounds divine!! What a great experience. 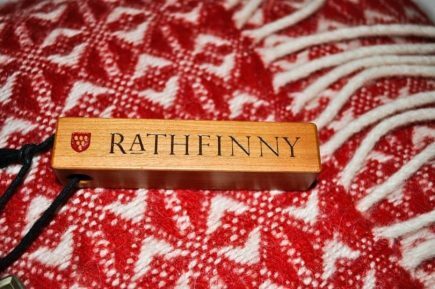 Thanks for the informative post on Rathfinny Wine Estate! 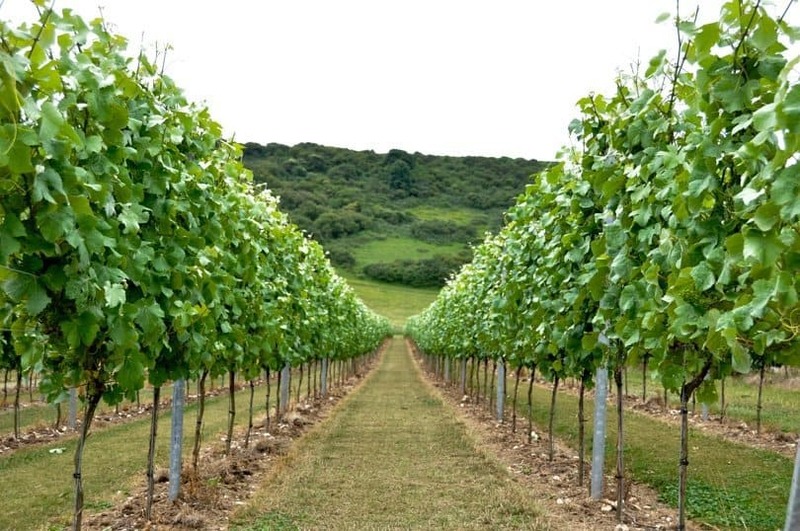 Keep your eyes open for Sussex Sparkling – you could be drinking it instead of Champagne soon! Poor me a glass! It’s so beautiful there, I’d love to hang out, sip wine, and tour the countryside. I love sparkling wine! 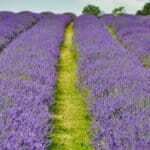 I would like to visit on our next trip the UK. It looks like a really beautiful place! 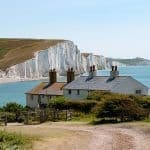 If you’re looking for a weekend in the Sussex countryside this is perfect – vineyards, little villages, great walks, excellent food and WINE! This sounds like pretty much my perfect weekend! Love sparkling wine and its great to see how well it’s doing in the UK now. 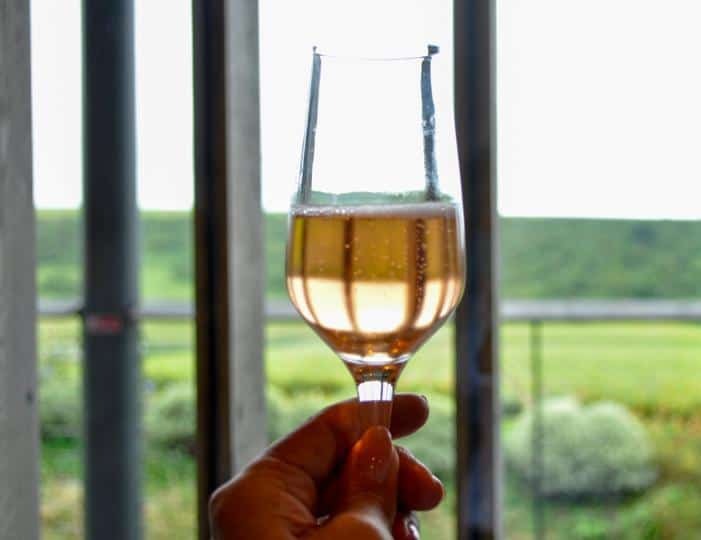 Mine too – add in a nice pub roast on the Sunday afternoon and we’re there 🙂 The sparkling wine scene in Sussex is so exciting right now and 2016 has been an excellent year for the grapes so we’ll see what transpires…! Thank you! You’re very spoilt when it comes to wine regions then! Beautiful pictures! I love vineyards, they are just so beautiful. The food looks amazing too!